The Cloud Book by Tommy de Paola – The cloud book has tons of great facts about clouds while still being engaging for younger children with its wonderful pictures! R listened intently as I read through the pages. At times, I didn’t get to read all the information on the page since R was ready to move onto the next page and would flip the page for me. I mixed up some cloud dough using 4 cups of all purpose flour and 1/2 cup of oil. I used vegetable oil so that there wouldn’t be a concern if R decided to give the cloud dough a taste. Cloud dough is super fun since it holds form well and isn’t as messy as some of our other creations. I added some “raindrops” in the dough using coloured gems plus I added some bowls to keep R engaged since her favourite way to play is to fill and dump. R loves it when I pull out a sensory bin! 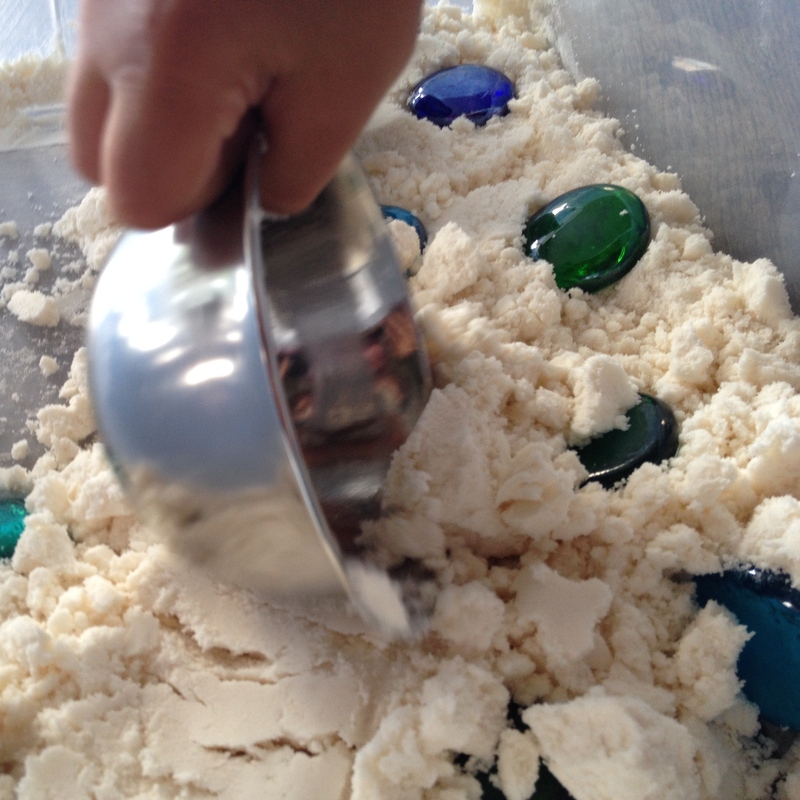 Sensory play is a means through which young children can explore and learn about the world and so I try to inject our weekly activities with numerous opportunities for R to use multiple senses during play. a. Colour Mixing. Explore webpages and books that show different coloured clouds, such as dark storm clouds, white fluffy clouds, or sun drenched colourful clouds. Offer the child some liquid water colours in small squirt bottles and allow him/her to add colour to the cloud dough as s/he deems fit. b. Encourage Imaginative, Constructive and Symbolic play. Ask the child the following open-ended question: if there was a world in the clouds, what would it look like? Make available a variety of arts and crafts materials to the child along with the cloud dough sensory bin. In the Primary Program, constructive play is defined: The child uses materials to make a particular product representing objects, ideas, or processes (e.g., paintings, drawing, models). Symbolic play is also defined: The child gives objects properties that suit the needs of play (e.g., a block becomes a car). We don’t often get big fluffy clouds in BC, like from what I remember as a child in Ontario, that looked like different things. Today, there were plenty of shapely clouds to explore. “Cloud” is a new vocabulary word for R and today was the first day I introduced it to her. I began by pointing out objects she was familiar with, like trees, birdie, leaves, etc. I then said cloud over and over again for her to develop the association with word and object. 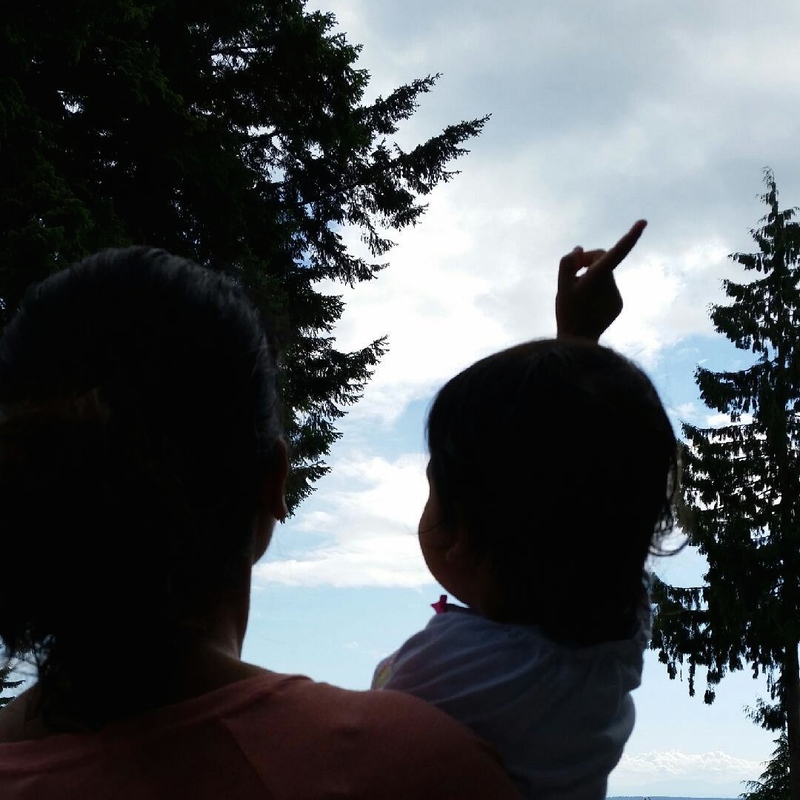 I encouraged her to point at the clouds as she said the word herself and she did exactly that. She’s getting quite good at parroting words I say to her! a. Find shapes in the clouds. Lay on the grass or on a blanket outside with the child on a cloudy day. Ask the child what things s/he sees in the clouds. Is there a bear, a car, a house in the clouds? Encourage the child to come up with a story about what those objects are doing in the sky by asking open-ended questions (questions that don’t just have a yes or no answer to them) about the objects s/he spots. What is the bear searching for? Where is the car going? Who lives in the house? b. 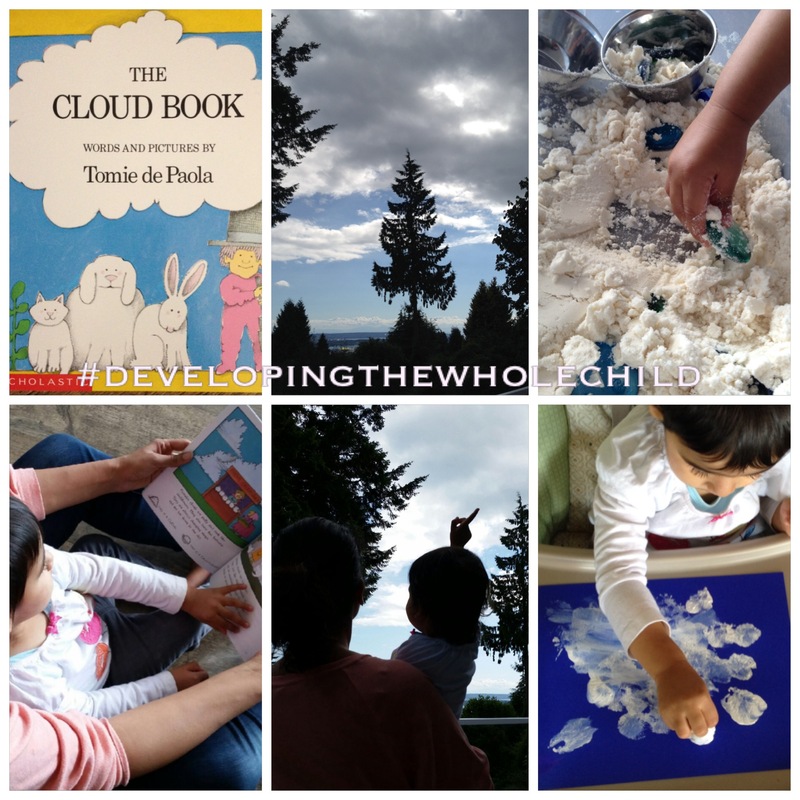 Use the information found in “The Cloud Book” and try to determine what types of clouds the child has seen. Conduct daily observations of the clouds and see if the child can spot different types of clouds. 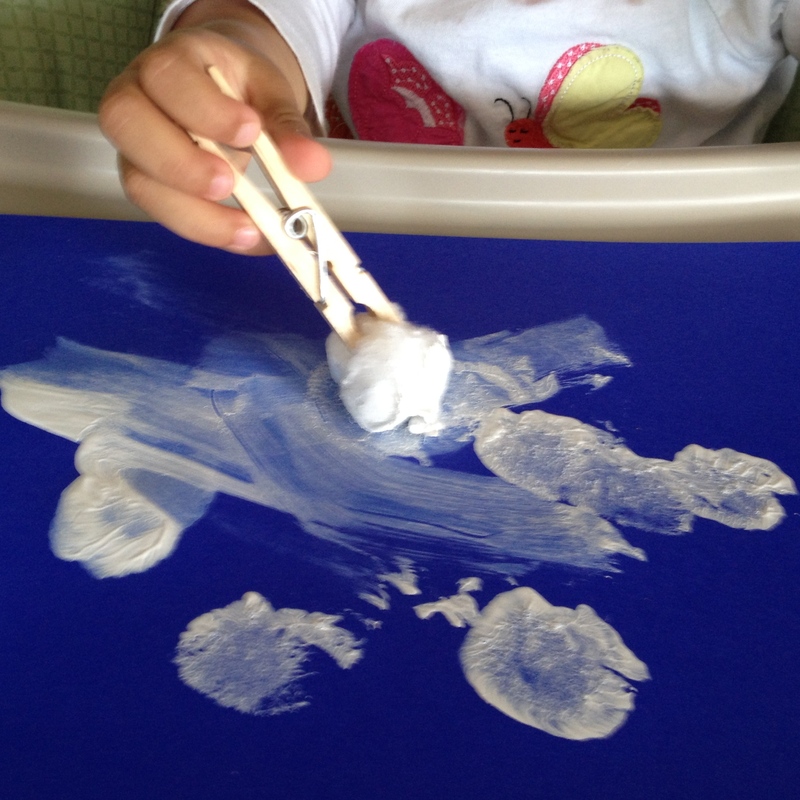 Using a clothes peg to hold a ball of cotton dipped in white paint, R painted white “clouds” onto a blue piece of construction paper. Her initial instinct is to create strokes with the cotton ball, which is the technique I had demonstrated to her in the past. I tried to encourage her to blot the paint as well, but allowed her to do as she pleased. In the end, she made a lovely series of blots and strokes with the paint! a. Practice the stippling technique with older children. Give the child a variety of colours of paint and a equal number of clothes peg, cotton ball paint brushes. Encourage him/her to create a cloudy, stippled scene. b. Making The Cloud Book available to the child, encourage him/her to replicate other types of clouds shown in the book. Ask the child to consider what types of strokes or blotting techniques would be needed to make the different types of clouds. That cloud dough looks like a fantastic activity for little ones!